„Waterways Ireland“ hat interaktive Online Karten der irischen Wasserwege für Bootsurlauber zur Verfügung stehen. Die Nutzer können im Bereich (oben rechts) zwischen 7 verschiedenen Grundkarten wählen. Also für Jeden was ihm am besten gefällt. Folgende Kartentypen stehen zur Auswahl: Imagery, Imagery with Labels, National Geographic, Oceans, Open Street Map, Terrain with Labels und Topographic. 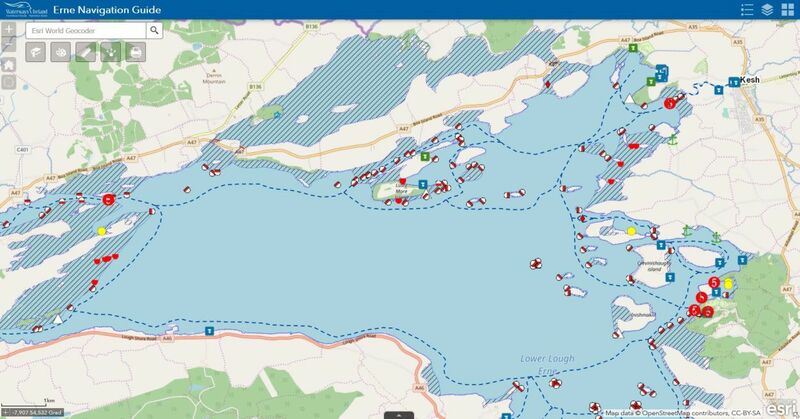 „Waterways Ireland“ has interactive online maps of Irish waterways available for boating tourism. Users can choose between 7 different basic maps in the area (top right). So for everyone he likes best. The following card types are available: Imagery, Imagery with Labels, National Geographic, Oceans, Open Street Map, Terrain with Labels and Topographic. Information, Warning, Aid to Navigation (ATON), Air Draft Gauge, Air Draft with Red ATON, End of Navigation, Green ATON, Green ATON Large Buoy, Red ATON, Red ATON Large Buoy, Co-located Green/Red ATON, White Pillar, Marina, Mooring Places, Lock’s, Service Facilities, Pump Outs, Slipway, Waiting Jetty, Bridge, Buoys – Firing Range, Overhead Wires, Navigation Channel, Weir, Sluice Gates, Canoe Steps, Curragour Falls, Area outside marked navigation usw. 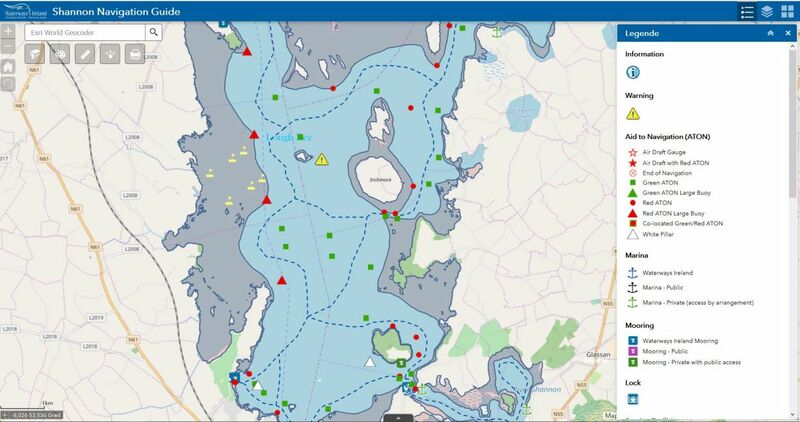 The legend on the map contains icons for: Information, Warning, Aid to Navigation (ATON), Air Draft Gauge, Air Draft with Red ATON, End of Navigation, Green ATON, Green ATON Large Buoy, Red ATON, Red ATON Large Buoy, Co-located Green/Red ATON, White Pillar, Marina, Mooring Places, Lock’s, Service Facilities, Pump Outs, Slipway, Waiting Jetty, Bridge, Buoys – Firing Range, Overhead Wires, Navigation Channel, Weir, Sluice Gates, Canoe Steps, Curragour Falls, Area outside marked navigation usw. „Area outside marked navigation“ und „Aid to Navigation (ATON)“ die finde ich persönlich sehr gut, da die Originaldaten für die Karten auf den Vermessungen der Mitarbeiter von WI und den Bojen Setzern beruhen. Die Karten basieren auf dem „ArcGiswebappviewer“ und können auf einem Datenserver nach Feststellung einer Abweichung sofort geändert werden. Die Zonen der „Shallow Water Areas“ Flachwasserbereiche sind hervorragend markiert. 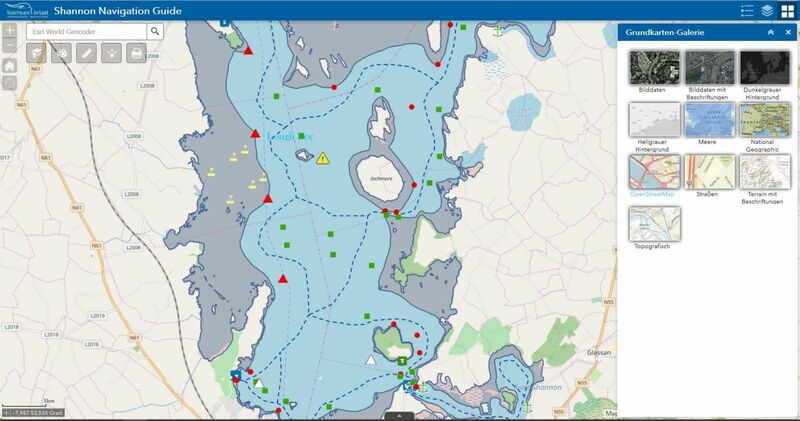 „I personally find „Area outside marked navigation“ and „Aid to Navigation (ATON)“ very good, since the original data for the maps are based on the measurements of WI staff and the buoys setter. The maps are based on the „ArcGiswebappviewer“ and can be changed immediately after a deviation is detected on a data server. The zones of the „Shallow Water Areas“ shallow water areas are excellently marked. Die Layer Liste beinhaltet die Operationalen Layer, die wenn man nicht alle haben will nach Bedarf durch entfernen des Hakens vor dem Layer abschalten kann aus der Karte. The layer list contains the operational layers, which can be disabled if you don’t want to have them all by removing the check mark in front of the layer from the map. Die Informationen die Waterways Ireland in die Symbole eingetragen hat sind aktuell und werden laufend entsprechen der Situationen geändert oder korrigiert. Achtung es sind öfter zwei Seiten, der kleine weiss Pfeile in der oberen Leiste zeigt zum umblättern. The information that Waterways Ireland has entered in the icons is up to date and is subject to change or correction on an ongoing basis. Attention there are more often two sides, the small white arrows in the upper bar shows to turn over. Zur besseren Ansicht des Post habe ich als Kartentyp OpenstreetMap gewählt. Serhr gut passen die Layer auch in die Imagery Ansicht auf das Luftbild schaut. Die Luftbilder sind immer aktuell. 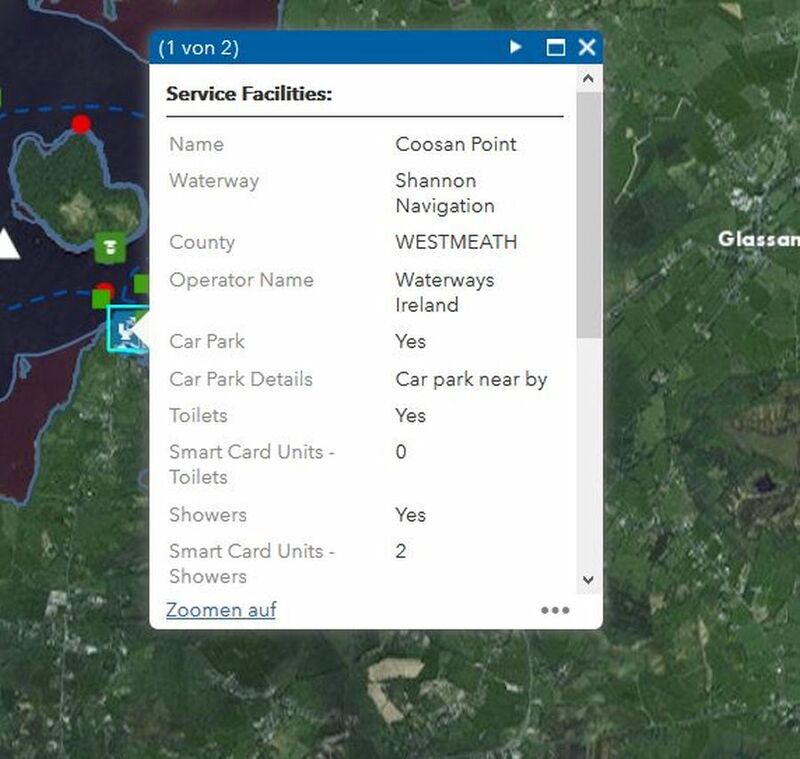 Danke an Waterways Ireland und ArcGis die diese „Interaktive Online Charts von Waterways Ireland“ zur Nutzung zu Verfügung stellen. Als Navigationsgrundlage auf den Wasserwegen gilt jedoch immer die Karte vom Vermieter. Eine rundum gelungene Interaktive Karte die auf dem Handy und/oder Tablet mit der entsprechenden „prepaid flat für 31 Tage“ zur Info über die Navigation der Irischen Wasserwage sehr gut ausreichen sollte. For a better view of the post I chose OpenstreetMap as the map type. Serhr well fit the layers also in the imagery view on the aerial view. 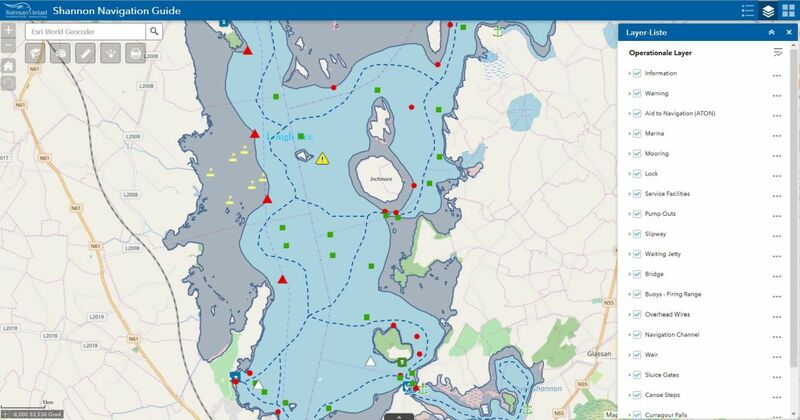 The aerial photos are always up to date.Thanks to Waterways Ireland and ArcGis for making these „Interactive Online Charts of Waterways Ireland“ available. As navigation basis on the waterways is always the map of the landlord. An all around successful interactive map on the mobile phone and/or tablet with the appropriate „prepaid flat for 31 days“ for information about the navigation of the Irish spirit level should be sufficient very well.